Jacob’s got a WiiU. I no has WiiU. It’s going to take many-a-puppy dog eyes for me to get one. But one day. One day, I tell ya! 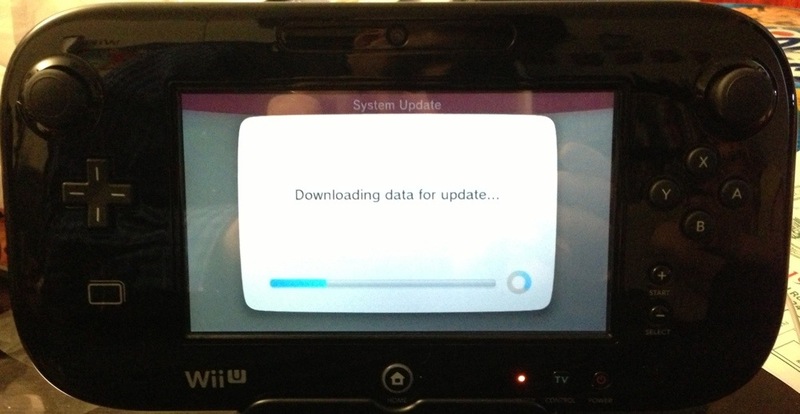 While setting up your new game system, the Wii U will connect to the interwebz to update it’s firmware. Pretty standard stuff for a console launch this day and age. This update, however, is reported to be upwards of 5gb! This means, if you purchased the 8gb model (why), you are almost out of space. This also means you will be watching your console update for a while if said interwebz is slow… are slow? This took my console about an hour. After the update, the console will start an update for the firmware in the controller. This took roughly 30 minutes before I was told the update failed. Strangely enough, the setup continued. Once you reach the home screen, you are given several options to choose. I figured I would launch Netflix and log in. This began an update to Netflix which lasted 5 minutes. Once that was set up, I clicked over to YouTube. I was told I need to connect to the Internet to download an update. A quick check streaming Netflix confirmed my Internet connection was sound. I decided to skip YouTube and check out the e-shop. The first page of the e-shop had a notification stating the update for YouTube and Hulu Plus isn’t out yet. Strange that I am given both of those options from the main menu. With nothing to buy in the e-shop, I decided to transfer my Wii data to the Wii U.
I clicked on the Wii icon and was given instructions on how to transfer. It then brought me to the Wii “channel” interface in crisp 480p! There was an icon to initiate the transfer process. Upon opening the icon, I was given instructions on how to complete the transfer and step one was to download the transfer app… What did I just click on? After downloading the app, I was given instructions on how to complete the transfer. I followed all of the steps on screen and was told to start up my Wii. I dusted off the Wii (as not to cause a fire) and proceeded to the Wii’s shop channel where I was greeted with a message that I had to update the Wii to continue. Keeping the Wii connected to the Internet is a lesson in futility (yes I have all of Nintendo’s ports open on my router). Three attempts and 10 minutes later, my Wii was updated. I continued on my journey to the shop channel to download the transfer app. I opened the app and was again greeted with instructions on how to complete the transfer process. I followed the on screen prompts (put the memory card in the hole [why are there so many instructions]) and watched as cute little Pikman picked up all my data from the console and carried it to a spaceship. If you performed the transfer between two 3DSs, this is very similar, if not way better. 30 minutes later and I was given more instructions. I turned off my Wii for the last time (ever? ), removed the memory card, and placed it in it’s new home. The Pikman’s ship landed on the Wii U and Pikman began carrying the data out. It was only another 20 minutes before it was finished. I thought to myself, “great, now what?” Now what indeed. Time to play a Wii U game! I popped in Mario and was given all too familiar of a sight. The game had to update… Great! Each game I put in had an update which took 3-5 minutes. I tried Mario and ZombiU but the game my wife and I got hooked on was Nintendo Land. And not just the game Nintendo Land but specifically Pikman Adventure. You see, my wife is a huge Pikman fan. We own the original GameCube versions as well as the rereleases on the Wii. In fact, a primary reason for me getting the Wii U is for Pikman 3. For the next three hours, I was Olimar and she was my trusty blue pikman! We battled our way through all of the stages. There was laughter, we shed tears, and finally we beat the last level… Only to find we only completed 50% of the minigame. I won’t spoil too much but if all of the compilations on this disk are as amazing as Pikman Adventure, this is the greatest game the system has and probably will have for a while. 1. Don’t buy a Wii U yet cause there are no good games. 2. If you buy one, make sure it’s the Black 32gb $350 one. 2.5. Also, it only comes with an HDMI cable but supports the Wii component cable. 3. If you buy one for Christmas, try to plug it in and get it updated before Christmas Day. The box is not sealed and the cables are easy to wrap back up if you’re paying attention. 4. If you get ZombiU, click in the left thumb stick to run. You’ll see what I mean in the first 60 seconds of the game. 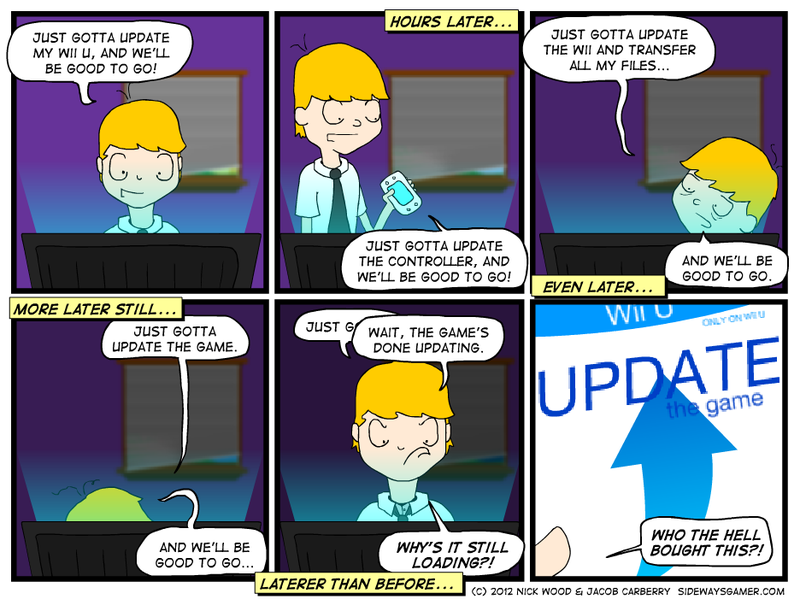 Anyway, expect more Wii U comics later and let me know if you have any questions! Wow… I wonder if anyone read all of that. Here is a trick I learned from work… If you read this whole thing, reply with you favorite color!